A few weeks ago we came to you with a need, as families do. We shared with you that advance teams in recently liberated communities are asking residents what they need most, and one answer keeps coming up: women’s sanitary pads and soap—hygiene kits that will give them back health and dignity. We listened. We asked you to show up for our sisters in Iraq by providing up to a month’s worth of sanitary pads, refugee-made soap, and more. You showed up! You gave more than $90,000 to give our Iraqi sisters the supplies they need to take care of themselves. 1. You responded so quickly. As soon as we posted about this need, donations started to come in. 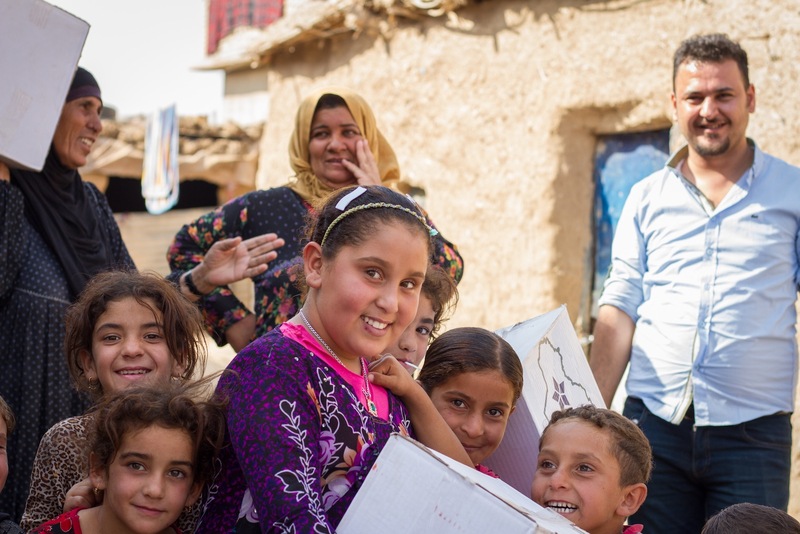 Your quick action allowed us to get supplies where they were needed right away and have supplies on hand for even more communities as they are liberated from ISIS. After years of living in fear, you are helping vulnerable communities feel heard and valued. To be perfectly honest, we weren’t sure how this request would be received. Not everyone is comfortable talking openly about this aspect of women’s health. But our social media channels were filled with lively conversations, suggestions, and recommendations. You were engaged and thoughtful—and through that, you expressed so much care. 3. You care enough for your Iraqi sisters to advocate for solutions that have worked well for you. We received many suggestions for specific products to address women’s menstrual needs—many of them reusable and therefore more cost-effective over the long term. While not every suggestion was a good fit for this particular crisis, for practical and cultural reasons, the conversation it started—and the concern you showed for our sisters in Iraq—was so, so encouraging. These women have suffered for years under ISIS, and experienced serious trauma. They long for the comfort of the familiar. Many homes here here aren’t built with private spaces to clean and dry reusable products. In traditional houses, there isn’t a bathroom arrangement the way most of us are accustomed to it—the sink is most often in a public area like a hallway or the living room. Islam places a high emphasis on hygiene and cleanliness. It is an important standard in all areas of life. Typically, any products that get stained aren’t reused. They would become single-use products, even if they were designed to last much longer. 4. You trust our experience enough to donate even if we aren’t supplying the product you prefer. Our primary program isn’t food or water or hygiene kits. Our first response is listening. That precedes and informs everything else we do. It’s one of the reasons we have developed trust and respect where we work. Many of you have told us how much you value way we work in local communities, and we are grateful for your support. Over the years you have proven time and again that you are the people who go where others won’t, to love the people no one else will love This month you showed so many Iraqi and Syrian families—women and girls—that you want more than their survival. You want them to be well. Thank you for caring about the details. Thank you for showing up whether the need is food or sanitary pads. Thank you for loving the people of Syria and Iraq so well.